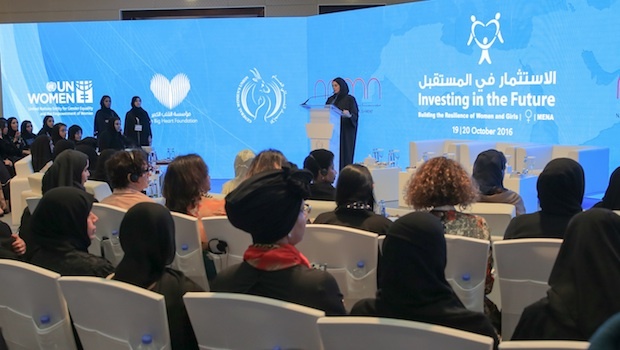 The UAE must establish a ministry for women to further empower their role in the country, the wife of Sharjah’s ruler and chairperson of NAMA Women Advancement Establishment Sheikha Jawaher bint Mohammed Al Qasimi has said. Speaking at a conference in Sharjah, she said the UAE had already achieved several milestones in enabling women’s empowerment. “All of us today are here in the UAE, a country that has set numerous milestones by introducing numerous new ministries to cope with the growing demands of progress,” she said. “As women are crucial drivers of progress, I believe the time is right to be at the forefront of women’s ambitions by introducing a ministry for women’s affairs. “A ministry for women’s affairs will help ensure the sustainability of the empowerment of women. It will advance their roles and invest their capabilities in serving their society and nation, helping them to face any changes that might arise in the future,” Sheikha Jawaher added. In a panel discussion following her speech, Ohoud Khalfan Al Roumi, minister of state for Happiness, also emphasised that new strategies and legislations at the federal level were needed in the field of women’s advancement. “Today, 54 per cent of our government bodies are occupied by women, 70 per cent of our graduates are women, and the revenue generated by them exceeds Dhs50bn. “There can be no development and no progress if our women are left behind,” she added. The UAE aims to become one of the world’s top 25 countries for gender equality by 2021 (currently it ranks 41 worldwide). To achieve that, the country’s Vice President and Prime Minister and Dubai’s ruler Sheikh Mohammed bin Rashid Al Maktoum assigned the council to activate the implementation of the gender balance index. The index aims to support the efforts of individuals and organisations to enhance gender balance in the UAE via three initiatives. The first initiative includes documenting the efforts of supporting bodies through the ‘UAE gender balance seal’, the second involves the implementation of the ‘UAE gender balance order’ and the third is the establishment of the ‘best three UAE gender balance initiatives award’.